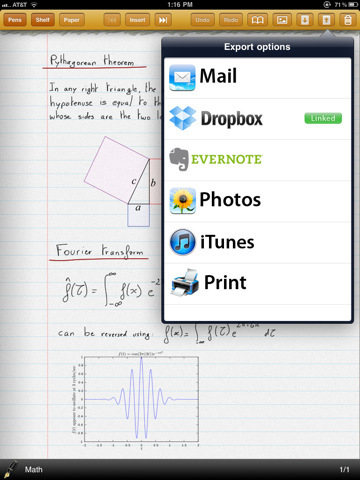 When the iPad made its debut, notes apps were fairly straightforward. 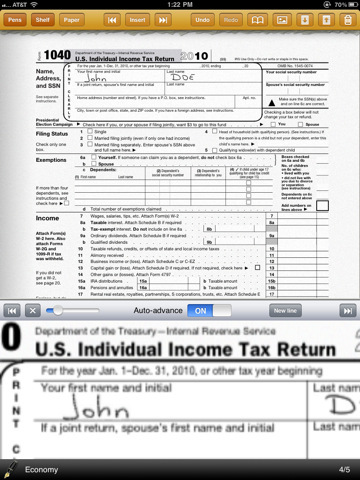 There were doc-style apps with keyboard entry, notes apps that felt like sketchpads, and finally, apps with PDF annotation capabilities. Ghostwriter Notes does all of the above and then some. The overall layout of Ghostwriter Notes is both traditional and intuitive. Crack the app open for the first time and it looks like you just tore off a new page on a legal pad. If you’re not one for legal pads though, there are paper choice options including college ruled lined paper, yellow paper, graph paper, list paper, and blank sheet music. There’s also an option to create custom paper from your iPad’s photo album, but what’s perhaps best about this feature is the fact that you can switch seamlessly between all of the above at any point in the note taking process. Once you’ve selected your paper you choose between pen, highlighter, and pencil. Each item comes in a selection of a few different colors and compulsive color coders will be happy to see that moving from one color to another is as simple as a tap. 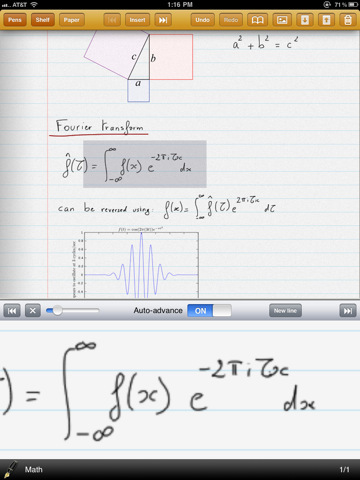 Although everything is pretty straightforward, the handwriting feature is one of the most attractive to every hit the iPad. When you choose your writing utensil a zoomed in box appears that lets you write in big broad strokes. From there everything is shrunken down to an smaller, but amazingly legible size. The actual process of writing on a screen with your finger feels slightly unfamiliar at first, but the wrist glider that slides up and down (depending on your preference) is a huge help. When one page fills up you can turn the page to a clean sheet, and in my testing I didn’t ever experience a limit on the number of pages that could be added to a note series. Also, Ghostwriter Notes lets users keep multiple, custom named notebooks in an iBooks-style bookshelf. The organization capabilities within this app are top of the line, but the features don’t end there. A minimal but robust toolbar along the top creates quick navigation to pens, the shelf, paper styles, an image insert button, undo, redo, download, upload and trash. For those who want to sync everything everywhere, the upload and download buttons might be most useful. 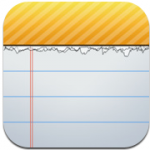 Notetakers can export to Mail, Dropbox, Evernote, Photos, iTunes, and even Print. Any one of these features alone are simple, straightforward additions, but Ghostwriter Notes seems to have it all without a lot of fuss. The whole app feels natural and intuitive, but for anyone with questions or suggestions, the developer, Michael Privat, maintains an incredibly helpful Facebook page. There the responsive developer fields suggestions and answer customer questions within hours. Productivity masters will download Ghostwriter Notes for its intuitive design and long list of features. They’ll get exactly that, plus access to a responsive developer who has built one of the iPad’s finest notetaking apps to date. 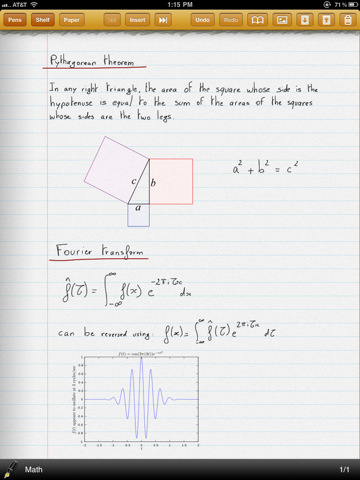 Bottom Line: Ghostwriter Notes makes taking and keeping notes on the iPad practical for the first time in the device’s history.